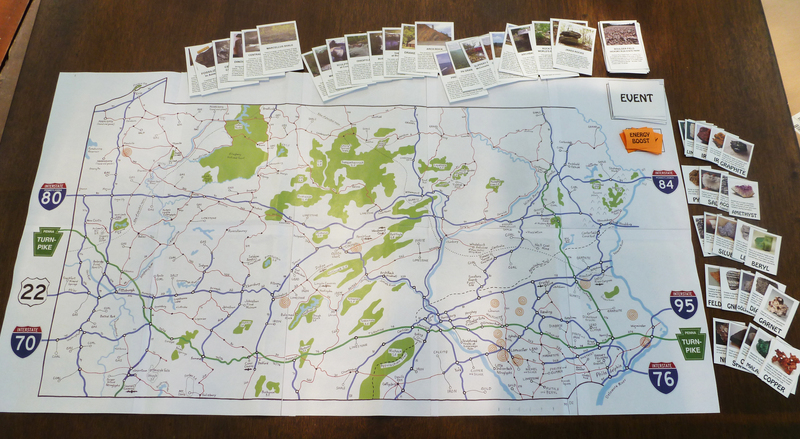 To learn about the geography, rocks, minerals and natural resources of Pennsylvania. 10 to 13, but high schoolers would enjoy it, too. Game time is flexible and can be adjusted by assign more or less task cards. A short game would be 30 minutes. A longer game could go well over an hour. Copies of the pattern pages (most in color, some black and white), scissors, glue stick, a die, a piece of thin clear plastic, and some permanent markers (only need them for one dot of color, though, and you might be able to substitue a dot of paint or something else you have around the house). There are also ENERGY BOOST cards that you collect when you land on GAS or COAL deposits (these give you an extra roll when you need it) and EVENT CARDS that mix things up a bit with quiz questions, helicopter rides, closed roads, earthquakes, flooded roads, sinkholes, and chances to swap cards with other players. Often, the event cards involve all of the players, so there is very little “down time” waiting for your next turn. NOTE: This game is “origins neutral” and does not give ages of rocks. The game is entirely suitable for your students no matter whether you favor secular materials or religious ones. It’s great for everyone! Virtual visits to some of these places are available via a YouTube playlist: www.youtube.com/thebasementworkshop. Click to see all playlists, then find the PA Game. The file was too large to upload all at once, so I broke it down into smaller chunks.